Ten intrepid entrepreneurs took center stage at Sand Hill Angels RAW pitch night last Thursday evening, presenting a range of breakthrough ideas to a gathering of financial angels, world class business advisers and local techies. Local startups accepted the invitation to a pitch session for young businesses in response to an invitation from Sand Hill Angels director Mark Mitchell. Mitchell said the group wanted to offer a low pressure environment for new companies to present ideas and receive feedback. He also wanted to let start up companies know about Sand Hill Angels interest in investing, now or later. Bonnie Lipscomb, Director of the Office of Economic Development for the City of Santa Cruz, one of the sponsors of the evening’s event, shared an invitation to businesses interested in locating in the city, explained the business services provided through the department and on its website, and offered “woodie” sunglasses as very cool swag. As representatives for each company stepped up to their 15 minutes of fame — 5 minutes each for their presentation with no visuals, Q&A, and finally feedback — a clock ticked down on the screen behind them, with the audience participating in the timekeeping. Participants who had presented in other forums shared their perspectives about the Pitch RAW venue. 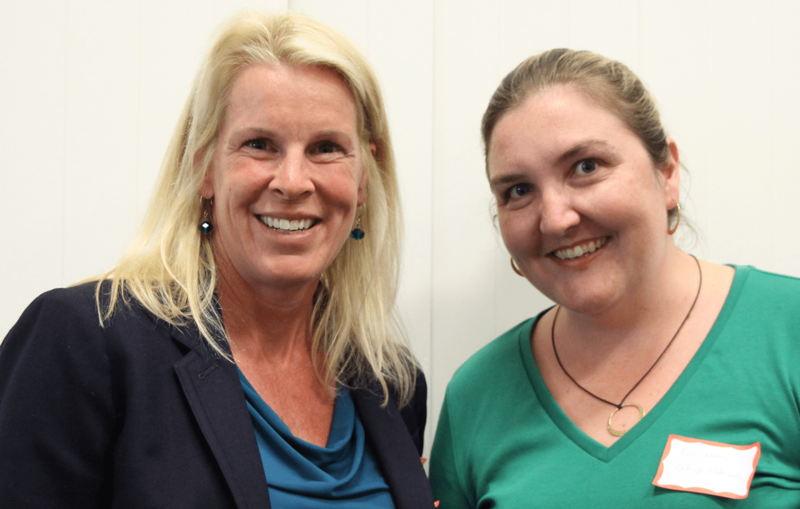 After Calliope Waterworks’ presentation at Sand Hill Angels RAW pitch night, Hilary Bryant, CMO and Keri Waters, CEO share a smile. Credit: Jan Janes Media. Metta — Erik Gillberg described this venture as finding the best friends you’ve never met. He detailed the statistics about the decline in number of close friends and the benefits friendship brings to healthy, happy, productive lives. Initially planned as an iOS and Android app, he detailed features focused on gathering like minded people together. Lithomobilus — Lise Quintana, CEO with Narrative Technologies, shared her vision for a nonlinear suite of e-reader tools that allows digital-first navigation of scrolling, swiping and tapping. Readers can choose to follow specific literary characters and not read the story from traditional beginning to end. Authors can share character development and plot points as add-ons, similar to DVD extras. Publishers can break up content and sell in smaller segments, similar to iTunes selling a single song and not an entire album. Calliope Waterworks — CEO Keri Waters presented the product as a residential, whole-house flow meter that uses predictive analysis and machine learning to profile water consumption with the goal of water use reduction. An app is in development now, and the company plans to serve the Bay Area, the Central Coast, and is targeting new home developers and working with local water districts. Podium Technologies — Co-founder John Widdifield shared a solution to drive-through, fast food ordering that uses data to speed the process, minimize order error, improve order upsells and offer a safety net for restaurants facing decreased profit margins in states where the minimum wage is set to increase to $15 per hour. His team has built an automated ordering system using dialogue management and speech recognition software to create specific voices such as Ronald McDonald or Jack in the Box at the drive-up order box. Casabots — CEO Deepak Sekar wants to revolutionize food preparation the way the Roomba has housecleaning: automate it. Targeting the deli section of supermarkets and restaurants facing wage increases and labor shortages, the prototype device dispenses ingredients, stirs, chops, cooks and bakes. With minor modifications it can prepare stir fries, curries, soups, salads and pastas. 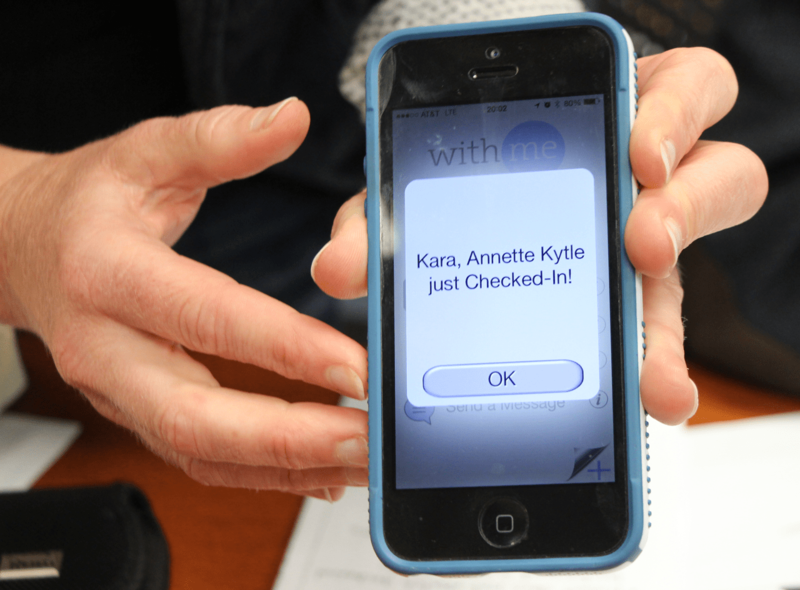 Kara Kytle displays the With Me digital check-in she received while pitching the start up software platform. Credit: Jan Janes Media. Assure Technologies — Co-founders Kara Kytle and Joe Rigney presented With Me, an iOS/Android app designed to make daily check-ins and alerts with aging relatives a social exchange, not an invasive monitoring tool. Their goal is to reimagine every aspect of aging and technology in terms of human connection. Vitality Quest — Chris Murray shared his decade long desire to correlate personal activity with multiple, desired health benefits. Current technology allows wearables to show a lot of graphs stacked on top of one another. His goal is to develop an app that shows a single dashboard displaying all of the data in a single graph. Outsite — Emmanuel Guisset described his personal odyssey that led to creating coworking spaces near attractive outdoor spaces, developing social networks and team retreat activities. Operating currently in Santa Cruz and San Diego, he looks to target other locations and business travelers to expand this lifestyle business. Valent Power — Founder Corwin Nichols plans to build, sell and install low cost, fast electric chargers that can recharge all current models of electric cars. He also wants to partner with municipalities along traffic corridors, and with destinations like shopping centers and parking structures, to meet the anticipated growth of 8 million electric vehicles in the next decade. Every company fielded five minutes of questions from the advisers pertaining directly to the details of their presentations. The business advice was specific and on point. The final five minutes was devoted to feedback, where both the advisers and the audience offered pointers to improve the pitches the next time. For all of the participants at this Sand Hill Angels RAW pitch night, there will definitely be a next time.